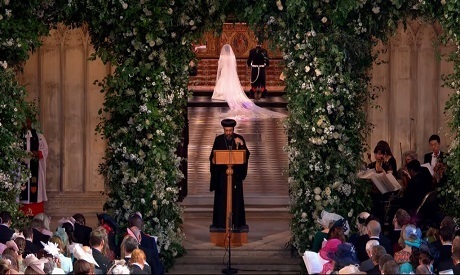 Coptic Orthodox Archbishop of London Anba Angaelos, who represents Egypt’s Coptic Orthodox Church in the UK, gave a prayer at the wedding of the British Prince Harry and American actress Meghan Markle in Windsor on Saturday. Angaelos joined the chaplain to the Queen, the Reverend Prebendary Rose Hudson-Wilkin, in reciting prayers of blessing for the marriage of the royal couple at Windsor Chapel. "Lord of life and love: hear our prayer. May they nurture their family with devotion, see their children grow in body, mind and spirit and come at last to the end of their lives with hearts content and in joyful anticipation of heaven," prayed the archbishop. Britain's Prince Harry and American actress Meghan Markle were pronounced husband and wife today by the Archbishop of Canterbury in a glittering union that brought a measure of modern Hollywood glamour into the 1,000-year-old monarchy. Thousands of visitors gathered outside Windsor Castle and lined the processional route to watch the couple on their big day. Angaelos is the first Coptic Orthodox Archbishop of London, having served as General Bishop of the Coptic Orthodox Church in the United Kingdom since 1999. In 2015, Angaelos received the Order of the British Empire from Queen Elizabeth to recognise his efforts and work for services to international religious freedom.